Update: Arkham Horror: The Card Game, was announced at Gen Con 2016, read about it here. 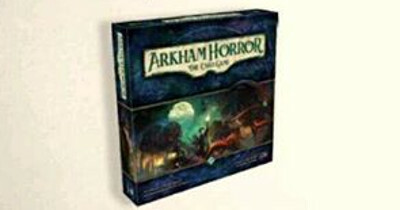 Original Article: A leaked image online has suggested that Fantasy Flight Games next living card game is going to be Arkham Horror, meaning yet again that our rampant speculation was correct! 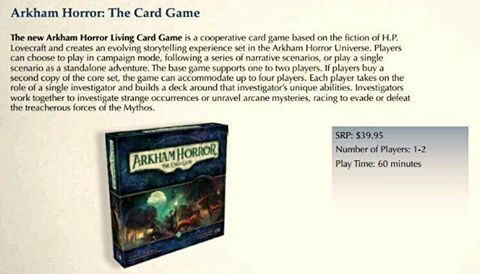 The leaked image, which shows the box art and states that the Arkham Horror Living Card Game will be a cooperative game that can be played in either campaign mode or as a standalone adventure. Out of the box the game will support one or two players but with two core sets the game can be expanded to 4 players. Other than that there is very little detail, but based on Fantasy Flight Games history we can expect this game to have a limited released at Gen Con and then have a major release a few months later. Okay, so we weren’t 100% correct with our prediction, but we did predict a new LCG from Fantasy Flight Games and we did give it a chance of being a Call of Cthulhu related product. I’m actually a lot more interested in a cooperative LCG than another competitive game, I really like The Lord of the Rings LCG and the cooperative gameplay takes some of the pressure off of the card buying.